Magic Wands or Magic sets make great party bags as it is something completely different and is another idea to make your party stand out from everyone elses. 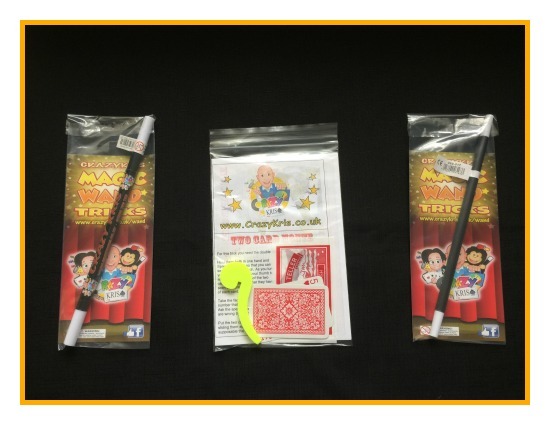 different at your child’s party, and then offer them your exclusive wand packs or magic sets. professionally packaged and sealed in a clear cello bag. They can go here and learn the tricks from the video. money and get stuck with extra packs if guests do not show up! If they dont want the wands I also offer the magic sets which include a magic instruction sheet to do tricks at home, a card trick, a magic fish and a magic belt hook is also included. These also sell to the client also. If you wish not to buy these it is no problem and I usually sell after the party each of them for £2 each. The birthday child will the special wand recieve the wand free of charge.